A personal documentary, this film is an evocative look at the traditional arts and skills practiced on Lamotrek Atoll. The film served as a report to the National Endowment for the Arts and a copy was also given to the community of Lamotrek as a "thank you" for its support along with a 16mm film projector with which to view it and other films which the community received through the Catholic Mission of Yap. Several years later, after the 16mm film projector had long ceased to work and after VCRs became available, this film copy was returned to me (Eric Metzgar). Given its sojourn of some ten years in the tropics, the film print is in remarkably good condition. Contains footage not seen in later productions: Lamotrek Atoll: Research Film Footage of a Traditional Carolinian Society and Lamotrek: Heritage of an Island. 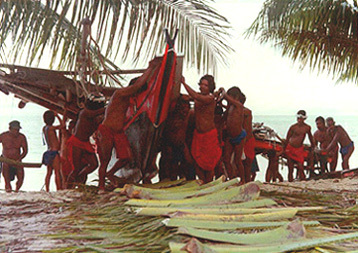 A film by Eric Metzgar in association with the people of Lamotrek Atoll, Yap State, Federated States of Micronesia.